Simplified Compliance Management for Consultants, Risk Professionals, Compliance Officers & Auditors. Track relevant regulatory alerts that bring awareness to change and see the impact to your organizational compliance. Intuitive ability to create custom frameworks based on industry best practices around security, governance and privacy. Enterprise wide view of assets risk exposure and impact to corporate governance policies and procedures. Estimate the exposure from numerous threats, vulnerabilities and the policies and procedures that control risk. Rapid assessment, measurement and management of business impacting information - seamlessly linked to your organizations assets. Demonstrate adherance to protection of Corporate Information (IP) and Personally Identifiable Information (PII). Assessing, Auditing and Risk made easy! ComplianceMapper is operated and owned by C2CSmartCompliance (C2C). 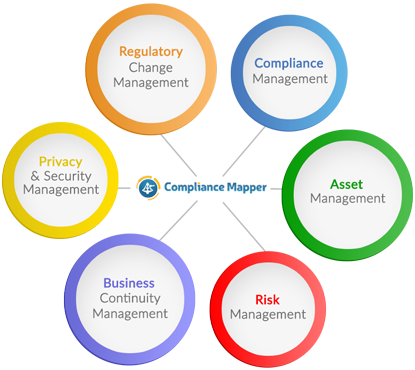 C2CSmartCompliance specializes in Enterprise Governance, Privacy, Risk and Compliance Software and Professional Compliance Management Services. C2C was founded by information security, risk and compliance professionals with over 25 years of GRC auditing and consulting experience. ComplianceMapper presents a powerful and intuitive correlation between the effectiveness of your compliance organization. Want more information on how it can help your organization?